What is a DBQ question? 1._____Requires that students analyze a series of documents from Part A of the DBQ question and answer a specific short answer question about each document. 2._____Presents a specific task in Part B which must be addressed in an essay response using information obtained from the documents presented in Part A and the student's knowledge of social studies. 3._____Is graded using a rubric which is made available to students during the test in the exam booklet. How do I answer a DBQ question? Step 1: Answer each question in Part A. Step 2: Read through the grading rubric. A DBQ essay question will always be accompanied by a grading rubric which explains how the essay response will be graded. Pay close attention to this rubric and be sure to meet all of the requirements so that your essay response can earn the maximum number of points. Be sure to read through the entire rubric so that you can discover not only what you should do to earn points, but also what you shouldn't do so that points will not be deducted from your response. Once you have an understanding of these criteria, begin writing your essay in Part B. Step 3: Compose a thesis statement. means "to make observations about something using facts, reasoning, and argument; to present in some detail." means "to illustrate something in words or tell about it." means "to point out; to set forth clearly a position or idea by stating it and giving data to support it." means "to make plain or understandable; to give reasons for or causes of; to show the logical development or relationships of"
Once you understand what the task is asking you to write about, compose a thesis statement that addresses these issues. Step 4: Organize the essay. Organize the information that you want to use in your essay through the use of an outline. During this pre-writing step, you should brainstorm as many facts as possible that could be used in your essay. Also make sure that you are addressing the task as well as the requirements from the rubric. Step 5: Write the introduction. A._____Revisit the historical context and determine if you can use part or all of this statement in your introduction. B._____Insert your thesis statement from step three. C._____If your thesis does not address the body paragraphs that will follow, compose a sentence that briefly introduces each topic. Step 6: Write the body paragraphs. Write the first body paragraph. Be sure to include all of the following components: topic sentence, supporting evidence in the body sentences, and a closing sentence. Follow this same format as you write the additional body paragraphs. Compose additional paragraphs if necessary in order to completely answer the essay question. Be sure to use most of the documents provided in Part A in order to provide evidence which proves your thesis statement, and to meet the criteria in the rubric to earn a full credit for your essay. Step 7: Write the conclusion. Summarize the subject of the essay. You can often do this by restating the question in a different way. Explain what you concluded about the essay question. Summarize how the information in the body of your essay proves your point. 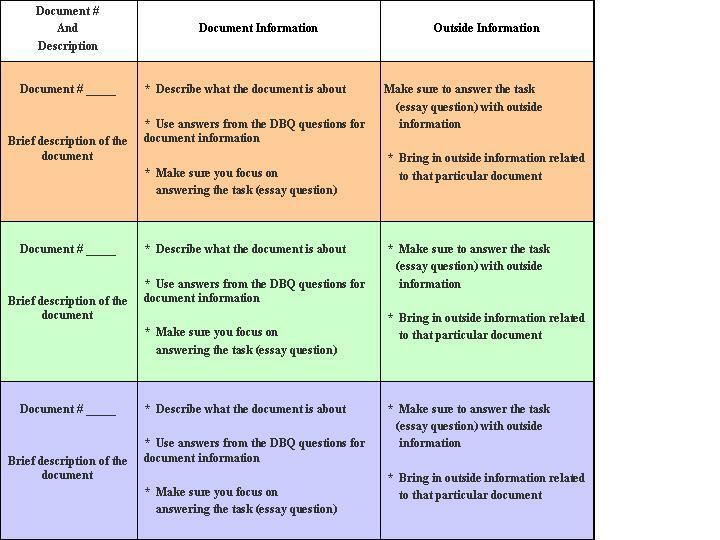 A sample DBQ essay grading rubric.